We offer most auto glass repair services including windshield replacement and repair, power window repair and replacement and wind shield chip repair. Windshield replacement falls under the comprehensive portion of most auto insurance policies. We work with your insurance to get your broken windshield replaced. Our goal is to make windshield replacement as easy as possible on you. We accept most most major insurances on windshield replacement. We offer the lowest cost possible to you, without sacrificing quality and workmanship! We specialize in windshield chip repairs. We charge a flat $20.00, or in most cases the repairs will be FREE with qualifying auto insurance plans. For your Convenience, we offer auto glass and wind shield repairs at our Repair Shop, or at your location with our Mobile Repair Service. Our mobile service covers most of towns in West, Central and South Central Texas. Contact us today for a free quote on your windshield repair or replacement. 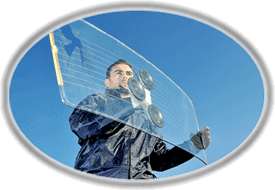 B & G Auto Glass provides wind shield and auto glass repair and replacement to the following towns and cities in Texas.